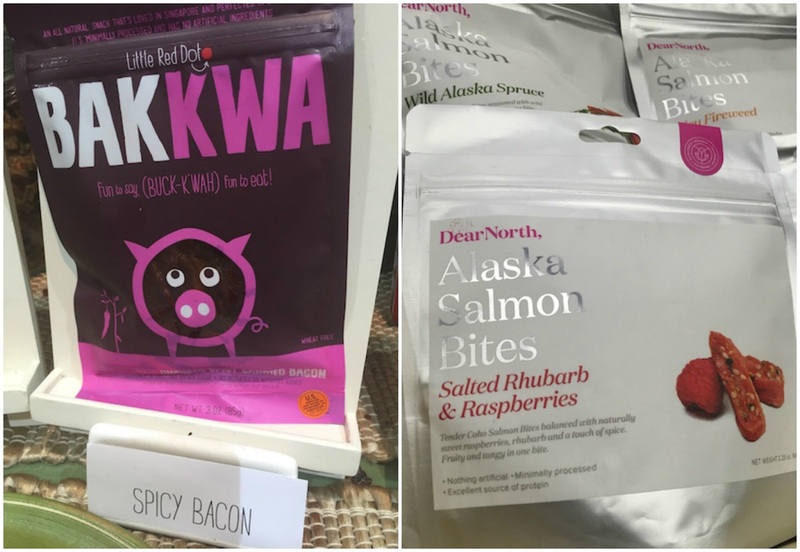 While it’s interesting to identify trends at the Fancy Food Show, it’s even more gratifying to discover delicious things you've never seen before. As I was trying to decide how to organize my finds, I realized the vast majority of my favorite products had something common. They were both sweet and savory. Without further ado, here they are. In a section of the show dedicated to emerging businesses was Kaleidoscope kale chips. While this business of kale chips flavored with ingredients like bone broth, miso and pesto might seem like something straight out of Portlandia, the truth is, the products are delicious! 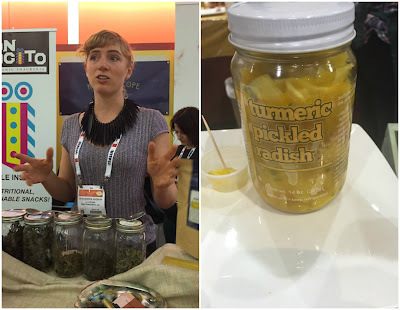 Lemon, miso, ginger kale chips and sweet potato bone broth kale chips have lots more flavor than plain kale chips and according to company founder Alexandra Hudson, they also have rejuvenating properties. I wrote about Dan Fruin's Genuine Grub pickles last year. This year he is introducing a new flavor, Turmeric Radish, made with fresh turmeric, ginger, daikon and apple. These zesty and crunchy pickles don't have heat but a funky sweet edge. Look for the product in February. The rest of the line is currently carried at Whole Foods. There is a category of biscuits that falls in between cookies and crackers. I particularly like Effie's Homemade. I don't believe they are new, but they were new to me. Their blend of sweet and savory make them very intriguing and versatile. They can pair with cheese or ice cream, or fruit. I'd love to try them with charcuterie or smoked salmon. 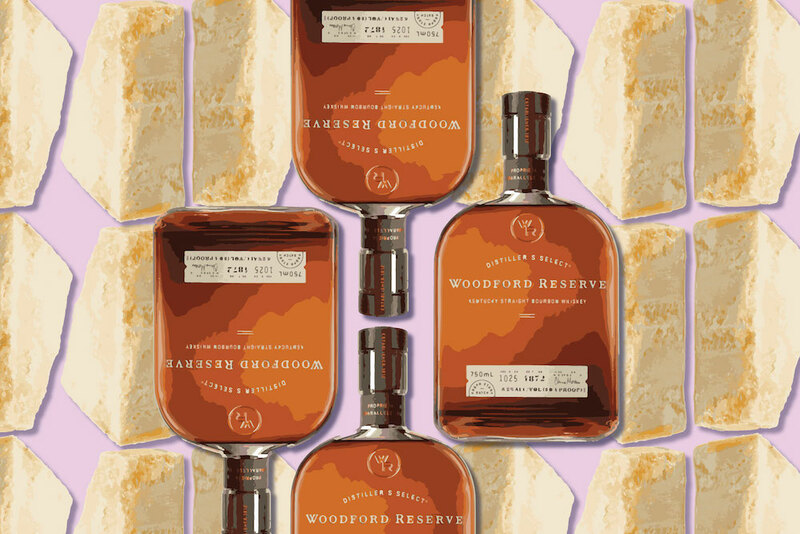 Depending upon the flavor, they go pair well with ice cold milk, coffee, beer or even whisky. Flavors include rye, oat, cocoa and nut, each with their own slightly different personality. There was a lot of buzz about bakkwa. What is bakkwa? It's a Chinese style of jerky that's sweet and soft. Little Red Dot makes their Singapore style version by a combination of marinating, grilling and roasting. It's hard to explain how ridiculously good it is. Their version is made with different meats and some different flavors like lemongrass ginger and chipotle. But the name "uncured spicy candied bacon" might just be the most apt description of their best seller. Curious about the name Little Red Dot? It's a nickname for Singapore. Dear North (love the name!) has introduced Alaska Salmon Bites from wild Coho salmon. It's tender yet chewy with really interesting flavors like sea kelp and sesame and my favorite, salted rhubarb and raspberry. It's a very unexpected combination but somehow works. Another favorite of mine was the line from Gran Luchito. Fergus Chamberlain might not be a name you associate with Mexican food, but you'd be wrong. Though born in Scotland he fell in love with the Oaxacan Pasilla chile while spending time in Oaxaca. He worked with local farmers and adapted recipes to develop a modern line of smoky yet not too hot spicy sauces and condiments using non-traditional ingredients like balsamic vinegar. 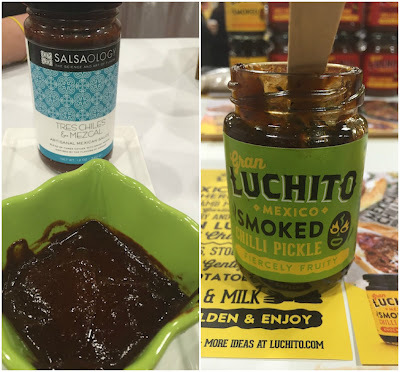 My favorites were the smoked chili pickle and the smoked chili paste. Both can be used as a spread, in rubs or smeared onto anything you want to imbue with smoky heat and are available on Amazon. I've written about The Preservatory at Visa d'Oro before and their wild and wonderful preserves that combine fruit with unexpected ingredients that range from garam masala to Pinot Noir. Their latest flavor, Moroccan Spiced Sour Cherry has those surprising savory elements that elevate a simple cherry jam into something both familiar and exotic, that is as good on toast as it is with cheese. Sadly these are not easy to find though some are available online. Coco aminos are nothing new, just new to me. They are made from coconut sap and serve in place of soy sauce for people with soy or gluten allergies. But I found the salty sweet flavor particularly compelling. It has a fruitiness missing from soy sauce. It's more expensive than soy sauce but could be a fun condiment for experimenting with in the kitchen. 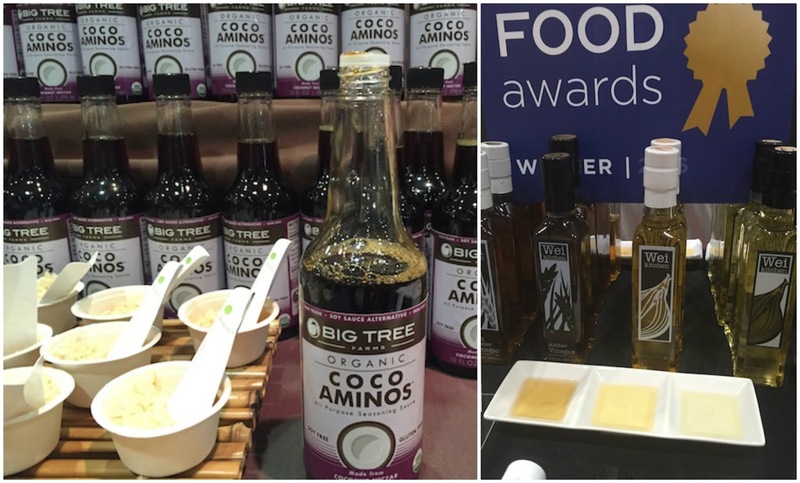 The coco aminos I tried were from Big Tree Farms who also offer a number of coconut sugar products which are lower on the glycemic index. A winner of a Good Food award, Wei Kitchen shallot oil is a nice option for creating vinaigrettes with an Asian accent. It has that very distinct mildly savory and sweet oniony flavor of shallots. Despite the sweetness, I would only use it with savory dishes like greens or noodles. There's a spicy version of the oil as well.